Coreboot (formerly known as LinuxBIOS) is a free software project aimed at replacing the proprietary BIOS firmware with a free system for loading and running the operating system. There are very few laptops available that are able to run properly when flashed with coreboot. 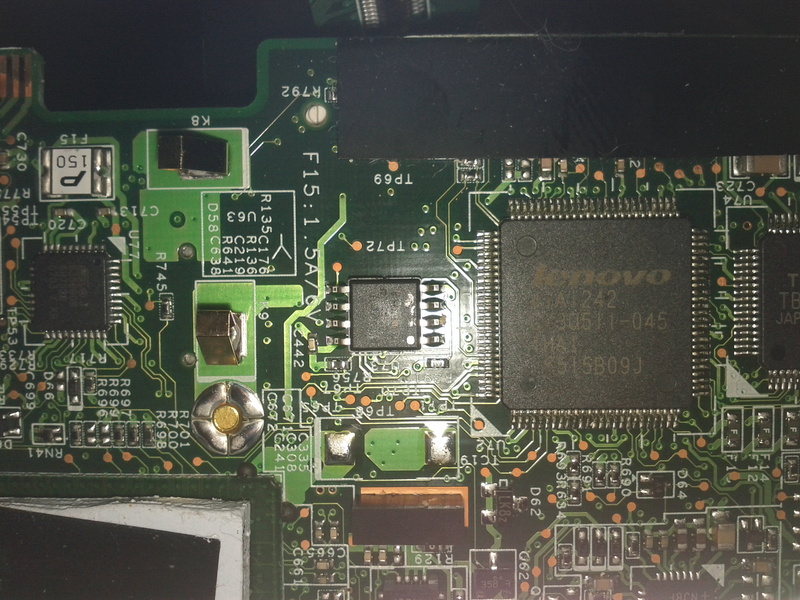 Sam has found a lenovo x60 6365CTO tablet and will attempt to use a program called flashrom to put Coreboot (with a SeaBIOS payload) on this machine. 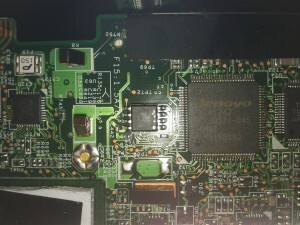 Unfortunately due to limitations of the IBM/Lenovo factory BIOS, flashrom can not detect which of the many flash chips that were used in the various revisions of these machines is present. At least not with enough specificity to be confident that the flash will be correct. So the solution is to disassembble the laptop and identify the chip visually! 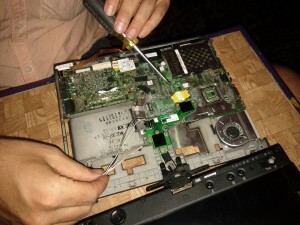 At tonights meeting we w orked taking apart the x60 tablet. Sam and Rob (Jason helped some too) dug into the tablet and stripped it all the way down to the motherboard. It was even harder to find the actual bios chip, as we did not know where it would be located on the board. We did know that it would be a SOIC8 chip (8 pins connecting to the motherboard) with extremely small writing on it. Eventually we found a likely part, but after scraping off a sticker (we’ll assume it had a factory bios revision level or some such on it.) Sam declared; “That’s not it, it is supposed to have some writing on it.” The markings are that feint. After lots of straining with a magnifier we deciphered “SST25VF016B”. Hurray, a known part supported by flashrom! Teardown and repair attempt on the “Breadbox” What’s this Flashrom thing?